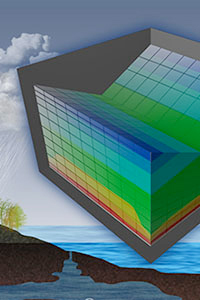 Scientists at Pacific Northwest National Laboratory and the University of Central Florida designed a multiscale model that simulates hydrological processes in an ecosystem with both surface water and groundwater. Enlarge Image. Results: Researchers from Pacific Northwest National Laboratory and the University of Central Florida developed a unified multiscale model that uses a single set of equations to simultaneously simulate fluid flow in an ecosystem containing both surface water and groundwater. Researchers applied the modeling approach to the Disney Wilderness Preserve in Kissimmee, Florida, where active field monitoring and measuring are ongoing to understand hydrological and biogeochemical processes. Why It Matters: The unified multiscale model significantly simplifies the simulation of hydrological processes in ecosystems. The model is especially useful for studies of wetlands and other locations characterized by frequently changing interactions between surface water and groundwater. The model integrates hydrological processes across spatial scales -- from the pore to the ecosystem -- and across hydrological domains that are traditionally handled using different models. As a result, the approach can improve efficiency and accuracy of modeling fluid flows, and thus the transport of nutrient supplies to ecologically important microbes, and processes affecting production and release of greenhouse gases. Methods: The simulation results demonstrated the Disney Wilderness Preserve is subject to frequent changes in soil saturation, geometry and volume of surface water bodies, and groundwater and surface water exchange. 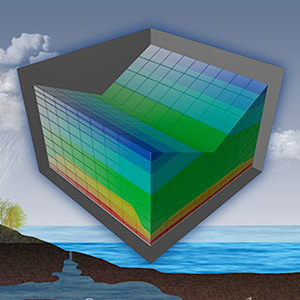 The model simultaneously simulated all hydrological phenomena in surface water and groundwater components, including inundating and draining, river-bank flow, groundwater table change, soil saturation, hydrological interactions between groundwater and surface water, and migration of surface water and groundwater interfaces. This approach is particularly suitable for simulating water flow in ecosystems with strong surface water and groundwater interactions. It will significantly facilitate modeling hydrological processes in ecosystems where soil or sediment are frequently inundated and drained in response to precipitation, regional hydrological processes, and climate change. As a result, the unified multiscale model will lead to a better understanding of fluid flow in active groundwater and surface water interaction zones, such as wetlands, which play important roles in global cycling of carbon and nitrogen, degradation of metals and organic contaminants, and production and mitigation of greenhouse gases. The simulations were performed using the Cascade supercomputer at EMSL, the Environmental Molecular Sciences Laboratory, a DOE national scientific user facility. What's Next? This work is part of ongoing research in the subsurface biogeochemistry, including work at nuclear weapons sites and elsewhere. Sponsors: This research was supported by the U.S. Department of Energy (DOE) Office of Science's Office of Biological and Environmental Research (BER) through the Terrestrial Ecosystem Science (TES) program. H. Li was supported by the DOE Earth System Modelling program.